You could argue that skirmishing is as old as war, but in the era of massed ranks of firearm infantry the advantages of skirmishing or ‘open order’ were recognised in the 18th century. By the time of the Civil War all armies had long had light infantry for the task, and in fact all troops were expected to fulfil the light infantry role if required. Nevertheless the need for specialist skirmishers was recognised and in 1862 Congress in Richmond passed an act to authorise battalions of sharpshooters, which were initially filled from suitable recruits from existing Confederate regiments rather than directly from the population. By the campaign season of that year there were sharpshooter battalions from many of the southern states, and more were to follow. Any unit operating in open order would usually divide the men into four-man teams that would operate in a less rigid manner than the ordinary soldiers, making use of cover as available, and hopefully incurring far less casualties than the solid blocks of troops still being used during the war. This is a most unusual set, because while it has a large number of different poses, no one is standing up straight. Skirmishing did not necessarily mean crouching or lying on the ground, but as there are already many sets of infantry standing it seems Strelets decided to concentrate solely on men trying to make themselves as small a target as possible, perhaps operating from behind cover or simply in the open but keeping as low as possible. The poses are a highly varied and often energetic selection, with men kneeling, crouching or on the ground in all manner of different ways, and we really loved them. A lot of them are in the act of firing or reloading, and a couple seem to be moving forward. The poses look really natural and so appropriate, and there are no particularly bad choices here in our view. Two of them are reloading their muskets - hard to do while crouching or lying on the ground, but it certainly happened. Weakest of the bunch is the second figure in the fourth row, who is firing while lying on the ground. This would be OK except that only his legs are on the ground, and his trunk, arms and head are well off the ground, but the figure is front heavy and cannot be made to stay upright. Also he is firing high, so would best be used against a sloping piece of cover - or perhaps simply uphill. The single-piece poses in this set are worthy of particular comment. The first such piece pictured is an officer holding a pistol - a pose we liked. Officers were often mounted, but of course if with their men skirmishing they would be keeping their head down like anyone else. Next to him is the only man on his feet, but crouching low. He has a holstered pistol but holds no weapon, and has a bag to hand as he leans forward with outstretched hand (as if petting a dog, we first thought). He could be doing lots of things, and is a very versatile figure, but a historical mistake gives the game away. On his left arm he wears an armband with a cross on it. The suspicion is Strelets thought the red cross was a symbol of medical personnel, and this man is some form of medic, but this is wrong. The red cross was only adopted as a medical symbol in late 1864 in Switzerland, and the American Red Cross was only created in 1881, so it seems highly unlikely that anyone used the red cross as a sign of medical help at such an early date as 1865. Luckily the armband is easily trimmed off, leaving a pose that is perhaps handing out ammunition, supplies or indeed medical help. 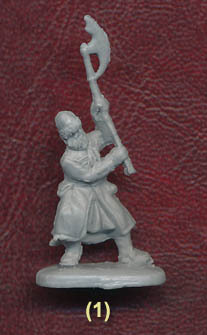 The next figure is clearly supposed to be a bugler, which is fine as the bugle was the means of communicating commands to troops spread over a wide area such as skirmishers. The pose is fine but the instrument is terrible, a sort of horn that never existed in this context. The downed man next to him is in a slightly clumsy position (obviously any position is possible, but the perfect right-angle of the right arm annoyed us). He seems to clutch a drum under his left arm, so a really unusual pose! Third in the row is a terrific figure sitting on the ground and apparently nursing an arm wound, and finally there is another downed man lying on top of a flag. It seems inconceivable that skirmishers would take their flag with them when skirmishing - far too obvious a target for the enemy - but for general infantry this is another interesting pose. We were very happy with the poses in this set as you can tell, but things are not so rosy when it comes to the skill of the sculptor. These are not particularly refined figures, and while the detail is OK it is not well done and there is a quite basic feel to all of the sculpting. The basic shape of limbs and some bodies is rather too angular, and there are holes and gaps in areas which shouldn’t have them, making these quite unappealing figures. Faces too are quite basic, although the muskets are quite well done, so it is the natural shape of the human body, particularly some of the feet, which is a disappointment here. The really poor ‘horn’ has already been mentioned, and the drum is also very poor, having a zigzag pattern around the side but not the tension ropes every drum needed (and a poor shape, since the surface of the drum faces the mould). However there is not a lot of flash, and very little excess plastic, despite the challenging poses chosen. It would be fair to say that while the Confederate soldier could present a neat and well-equipped appearance at some moments, at others they could be hugely varied and downright ragged. The men in this set are certainly a mixed lot in terms of uniform, with all manner of coats and hats being worn. Surprisingly the majority have long jackets and few have the short shell jackets that were in fact so common, so while those here look to be accurate, the overall mix is not representative of perhaps most actions. Hats too vary from brimmed examples to the official peaked cap, but look correct. Skirmishers, or at least sharpshooters, tended to be very lightly equipped to aid movement, relying on providence for most of their needs after the fight, so bearing that in mind some of these men are quite well equipped with pouches, haversacks and canteens. However again the story is very mixed, so we were happy with the kit on show here, although it should be noted that no one here has a bayonet fixed, and only four of the poses have one on their belt. There are a number of other observations that need highlighting with this set. Firstly, the Confederates generally marked their sharpshooters by having a cross on the arm (not on an armband apparently! ), of which there is no sign here, although this would be a very slight thing and so better done by painting anyway. Also, the flag lying on the ground is actually better than many Strelets have recently made because it is more of the sort of size that a proper battle flag would be. Clearly it is crumpled and misshapen here, as you would expect, but we guess the unfurled size is about 15mm by 18mm, which scales up to 108cm by 130cm, a respectable size. A pity there is no finial on the staff - perhaps torn off in the action? Next, the 'prone' man firing upwards is sculpted holding his musket by his ear, so hiding his face (if he had one) and making it impossible to be looking where he is firing. Such poses are often tricky to sculpt as one piece, but the result here is not good. Lastly, we come to the small lump in the second row. What it is we cannot say, but must assume it is meant to be a small piece of cover (such as a rock) for someone. We were not convinced this simple piece was worth the minimal effort necessary to produce. This is such an innovative set in terms of the imaginative and appropriate poses, and of course many could also be used away from a skirmish, such as where a large formation of troops is being hit by fire and men are falling. Lots of terrific poses, and some always useful casualties too, with no issues over accuracy apart from the easily-removed armband. It is a shame then that these are not nicely made, so close up they are not pretty. However if you don't look too closely, then a tabletop battlefield with these guys scattered on it should look great, since the scene it would present would probably be much more realistic than the large units of perfectly formed troops we often see.